Lenalidomide plus dexamethasone (LD) is currently the mainstay of treatment for both untreated and relapsed or refractory multiple myeloma (RRMM). Although lenalidomide-associated venous thromboembolism (VTE) is a major clinical concern, its incidence and prognostic impact have not been delineated. In this nationwide retrospective cohort study, we aimed to determine the cumulative incidence of VTE and its prognostic value using two consecutive cohorts of LD-treated RRMM patients: the KMM151 cohort (N = 542) and the HIRA cohort (N = 1559). Data were collected from medical records for the KMM151 cohort and healthcare insurance claims database for the HIRA cohort. Throughout the study period, 24 patients (4.4%) in the KMM151 cohort and 80 patients (5.1%) in the HIRA cohort developed VTE. The cumulative incidence reached a plateau approximately 2 years after LD initiation. The 2-year incidence was 4.9% in the KMM151 cohort and 8% in the HIRA cohort. Higher starting dose of lenalidomide, previous history of VTE, and older age were associated significantly with an increased VTE risk. Early-onset VTE was associated significantly with poor survival. In conclusion, VTE occurred in 5–8% of RRMM patients treated with LD over 2 years, and early-onset VTE was a strong indicator of poor prognosis. Korean Multiple Myeloma 151 investigators are listed in the Appendix section. The online version of this article ( https://doi.org/10.1007/s12185-018-2540-1) contains supplementary material, which is available to authorized users. The authors thank the Korean Multiple Myeloma Working Party for developing and managing the KMM151 database and the KMM151 Investigators for contributing the data. We also thank Ju Hyun Lee, a data analyst at Seoul National University Bundang Hospital, for performing the statistical analysis. 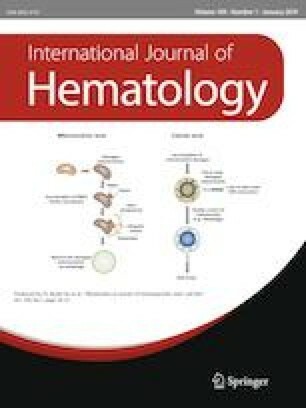 This work was supported by grants from the Korean Society on Thrombosis and Hemostasis (KSTH 2016-002) and Seoul National University Bundang Hospital (04-2012-003). This manuscript was edited by native English-speaking experts from BioScience Writers, Houston, TX, USA. The KMM151 Investigators are Jeong-Ok Lee (Seongnam, South Korea), Soo-Mee Bang (Seongnam, South Korea), Je-Jung Lee (Hwasun, South Korea), Kihyun Kim (Seoul, South Korea), Chang-Ki Min (Seoul, South Korea), Cheolwon Suh (Seoul, South Korea), Dok Hyun Yoon (Seoul, South Korea), Jin Seok Kim (Seoul, South Korea), Yoo Jin Lee (Daegu, South Korea), Joon Ho Moon (Daegu, South Korea), Sung-Soo Yoon (Seoul, South Korea), Inho Kim (Seoul, South Korea), Jae-Cheol Jo (Ulsan, South Korea), Ho Sup Lee (Busan, South Korea), Seong Kyu Park (Bucheon, South Korea), Ho-Jin Shin (Busan, South Korea), Min Kyoung Kim (Daegu, South Korea), Yeung-Chul Mun (Seoul, South Korea), Mark Hong Lee (Seoul, South Korea), Yong Park (Seoul, South Korea), Hyeon Seok Eom (Goyang, South Korea), Hyo Jung Kim (Anyang, South Korea), Sung Nam Im (Busan, South Korea), Sung-Hyun Kim (Busan, South Korea), Young Rok Do (Daegu, South Korea), Won Sik Lee (Busan, South Korea), Su-Hee Cho (Busan, South Korea), Jun Ho Yi (Seoul, South Korea), and Jae Hoon Lee (Incheon, South Korea).